Published on July 8, 2010 in Caribbean, CARICOM, General T&T and People's Partnership. 11 Comments Tags: CARICOM, Jamaica, Kamla Persad-Bissessar, Politics, T&T Govt. Taking into account the noises made again last week from one end of the region to the other by citizens growing more cynical about the state of health of the regional integration movement, it remains a matter for the record, that the Montego Bay Summit qualifies for positive review on several fronts. “IT IS just ridiculous!” St Vincent and the Grenadines Prime Minister Dr Ralph Gonsalves said as he supported Prime Minister Mrs Kamla Persad-Bissessar’s view that TT is seen by some as the ATM (automatic teller machine) of the Caribbean. Caricom – and carry-go where? ECONOMICALLY stronger Caricom nations need to take the lead in ensuring the development and growth of member nations who are economically weaker, according to Dr Ralph Gonsalves, by contributing to the Caricom Development Fund (CDF). Whatever Caricom’s leaders might have been expecting from the stylish Prime Minister of Trinidad and Tobago with her sunny smile and nimble dance moves, they had to adjust their thinking quickly to accommodate a tough talking politician keen to forge a different agenda for Trinidad and Tobago in the region. CARICOM nations can ill afford to engage in protectionist measures against one another and must join forces to rise above the global economic realities which face the region today. The Trinidad and Tobago Prime Minister, the only woman in the club of leaders, had stolen the show. The audience loved it, and they loved her for what appeared to them to be her daring. And when this was over, she would go elsewhere with part of her entourage, to a club on the city’s “hip strip”. Kamla Persad-Bissessar, prime minister of Trinidad and Tobago, entered the final night party for the 31st CARICOM Heads of Government conference in Montego Bay, St James, at 9:50, two hours after the scheduled start time last Wednesday night, and all other leaders in the room instantly became backbenchers. Her girlish flowered dress, pink mini-sweater and white wedge-heeled sandals gave no impression on Tuesday that she had come to cut big men down to size. Financially speaking, that is. But new Prime Minister Kamla Persad-Bissessar apparently succeeded in doing just that—and then some—at the recently concluded 31st Caricom summit in Montego Bay, Jamaica. Indeed, summit host, Jamaican Prime Minister Bruce Golding, who whirled Persad-Bissessar round the dance floor at a post-summit reception on Wednesday night said he had run against many people, but not against anyone like her. Golding remarked he was glad he didn’t have to. PRIME MINISTER Kamla Persad-Bissessar was moved to tears when she visited her alma mater at the University of the West Indies’ (UWI) Mona campus in Jamaica on Thursday. Yet another Caricom summit has come and gone but what remains constant is the region’s failure to implement major programmes such as the Caricom Single Market and Economy (CSME). 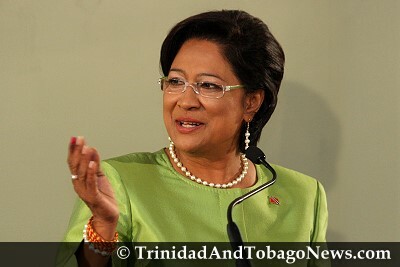 IT should certainly be no surprise to hear Prime Minister Kamla Persad-Bissessar state in her recent remarks to reporters at the Caricom meeting in Jamaica that Trinidad and Tobago must not be regarded as the region’s Automated Teller Machine (ATM). Prime Minister Kamla Persad-Bissessar’s first Caricom outing was marked by her blunt questioning of the utilisation, and indeed the continuation, of the Petroleum Fund. “Trinidad and Tobago will not shirk in its responsibilities, but we must be conscious of the present fiscal deficit and the global crisis,” Mrs Persad-Bissessar told journalists in Montego Bay. TWO DAYS after expressing concerns about the disbursement of money under the Caricom Petroleum Fund (CPF), Prime Minister Kamla Persad-Bissessar on Tuesday expressed similar concerns about whether there was transparency and accountability in the management of money in the US$250 million Caricom Development Fund (CDF). Addressing a news conference at the Hilton Resort and Spa, Persad-Bissessar said all participating Caricom states each contribute US$120 million to the CDF and the remaining US$130 million comes from the regional private sector and other sources. Prime Minister Kamla Persad-Bissessar yesterday cautioned regional governments that Trinidad and Tobago does not operate like “an ATM card” while stating the oil-rich twin-island republic was not prepared to fund the regional security budget. Yesterday, in an editorial headlined “Trinidad’s being unfair, Kamla,” the Jamaica Gleaner launched yet another attack on this country’s energy policy and its impact on trade within the Caricom single market. The newspaper, one of the oldest in the region, approvingly quoted the Jamaica’s Minister of Agriculture, Christopher Tufton, as suggesting that “Trinidadian agro-processors enjoy an unfair advantage on two counts. They have cheap, subsidised energy and are allowed to import raw materials using an opaque tariff regime.” Tufton had complained recently that T&T manufacturers are importing peanuts from extra-regional sources “with unclear duty arrangements,” processing these peanuts using “subsidised energy” and selling the snacks in Jamaica free of tariff, in accordance with the common market principle. The main concerns raised at the 31st Caricom summit by Prime Minister Kamla Persad-Bissessar ended up at summit conclusion last night with a response from Caricom leaders pledging to start paying up arrears on certain regional projects and to begin moves to revive the flagging 37-year-old regional institution. The points were among summit conclusion announcements by Caricom chairman Jamaican Prime Minister Bruce Golding at the closing media briefing last night. And in the face of calls for Caricom secretary general Edwin Carrington to stand down to allow Caricom to go forward, Carrington said he would be considering shifting from the institution which he had headed for the past 18 years. MONTEGO BAY: THE Global Financial and Economic Crisis: Challenges to recovery and Critical Issues of Economic Management. This was how the conference agenda for Tuesday’s working session at the Caricom summit which wrapped up here last night signalled its decision to continue talking about the impact of this phenomenon on the region. A permanent governance council is being established by Caricom leaders to address the “implementation deficit” and other problems hampering the movement and efficiency of the 37 regional grouping, Prime Minister Kamla Persad-Bissessar and St Lucia Prime Minister Denzil Douglas confirmed yesterday. THE Government of Trinidad and Tobago has raised as a matter of urgency, the issue of the operation of the Caribbean Development Fund (CDF), Prime Minister Kamla Persad-Bissessar told reporters here yesterday. She said she was seeking answers to a number of critical questions on this matter. I hope local manufacturers and business take heed eh, when alyuh find it hard to get alyuh products into our neighbors stores, don’t fret eh, cause Kamla have the Trini ATM card that only fuh we and Guyana apparently. Go ask she tuh use it…papayo! Why must Trinidad and Tobago fork out funds for use by other Caricom countries when its own house needs to be put in order? Charity begins at home. I was surprised when Manning gave away so much money to Haiti and I understand Kamla wants to add to the money already frittered away. The USA, France and Spain must take full responsibility for Haiti. They propped up Duvalier not Trinidad. The money going to Haiti will ensure that their population grows out of control and maintains the cycle of poverty and hopelessness. With respect to the other Caricom Nations, I will like an answer to why the Caricom Countries do not like and appreciate our people but have a distinct and extravagant desire for our funding. Secretary General, will you venture a response? It is most frightening to me, when I see comments such as these being made by intelligent human beings. It does not matter where we are on this planet we are inextricable connected to each other, for we are all created equal in the sight of God our heavenly Father. Had the devastating earthquake on that day strike Trinidad, and our villages, towns, cities, our citizens livelihood, hundred of thousand killed, many still unaccounted for, hunger crippling a nation, women and children have little or no shelter their privacy shattered, civil infrastructure ravaged, defence posture threathened or totally destroyed. Most likely our people and our government would welcome all the sustain aid and support from every country compassionate about our sudden turn of events. It is time we stop thinking politics and begin to see the moving hand of God at work. This is a time to be generous to our neighbours, give when it is in your power to do so without reproach, this a time be kind, this is a moment in human history to give love and be loved. I wish the people, and the government of Trinidad & Tobago all success in their internal endeavours as well as in their foreign policy. May God bless the twin island state of Trinidad and Tobago. Dont forget “is we time now”, so anything you hear or read is not surprising. There is something intoxicating about power and that is why casting that vote in the privacy of your booth is so important. For those who thought they were “giving someone else a chance”, it did not take long to hear from our sister Krishna. It would take a lot of christianity to convert a mind like that. Krishna Teewaree, it is because of this precise juvenile Trini attitude as displayed by you girl. Hey Krishna, when you were a ‘tiny ,little, bitty kid,’ growing up in your 10 room Couva mansion,next to Mikila Panday and her other elite sisters ,you and your 15 other siblings ,ever tried to defy your loving parents rules , and play a lil skip rope , hide and seek, or marble pitching with some of the poor, snotty nose , bare feet, runny nose kids in the village on the other side of town, but could not due to the fact that they could not afford to ,or they were too hungry to entertain you? Listen , there is a basic principle in economics that probably eluded you when studying in that yuppie Canadian University, and it goes like this:- An economic giant finds itself in a precarious situation, if it’s regional ,prospective, trading partners lack the means to do business with them ,because most of their countries are economically backward. Remember the end of WW2 and the American Marshall Plan investment ,to help Europe back on it’s feet? Similarly , in that 50 billion business that daddy controls in El Socorro,and Chaguarnas, some of the profits must be reinvested back to help desperate minimum wage workers , and efforts made to ensure that the lives of the poor across your nation are elevated, since they would eventually plough that back into your family’s business , as grateful consumers of products. Do you get it yet? As far as Haiti,just come off your selfish pedestal for a moment and imagine that it was your neighboring Guyanese ethnic cousins, instead of stupid , savage African , voodoo adoring ,descendants of slaves , my friend. Now that was not too bad , huh? Now tell me people , what kind of citizens have we developed in this country of ours? We could certainly appreciate Krishna Teewaree’s point if she was saying put country first as a loving concerned patriot , but take note that her underlying , though thinly disguised premise was – leave dem unfortunate ,stupid folks alone , let them swim on their own, simply because they do not look like half of our population, we are large and in charge, but get this -yet , why do they hate us again? I tell you folks , I so happen to again be on two weeks vacation, but prefer to walk around the world naked , with the threat of being stone by vicious criminals ,than to ever set foot in this country of mine. How much agin for a piece of land in St Lucia? Just kidding folks, for no amount of Krishna, could make me hate my country and it’s myriad of lovely people. Get help Ms KT for you are , obviously a sick puppy, but guess what is even my scary? You might just be the tip of the iceberg, as some say, and this attitude is also one that prevails towards our own T&T citizens. Does any have any statistics as to how many citizens are in our country whose parents are from another country, and the impact such could naturally have on both domestic ,and foreign policy? Come on Krishna, don’t worry, ah pretty sure the censor here at Trinicenter roots are in Grenada or St. Vincent… Just Like our national hero Tubal Uriah Butler (as in Mc Leod’s OWTU)…. So yuh could speak with a little more clarity. Now, who in CARICOM doh like ‘we’ Trinis? Stupes..
Kamla needs more education on the Caribbean before she perform any more ‘Kathak’ for CARICOM. (Hopefully the Marriage would not last too long after the honeymoon). Buh anyway, dem Jamaican say they flying American Airlines now..
Government has no more queries about the merger between Caribbean Airlines Ltd (CAL) and Air Jamaica Ltd.
First it was Federation under the Doc, den it was Arawack Cement factory questionable deal with dem upstart Bajans, and intelligent Chambers, recently , it’s Mankam, Caribbean vs Jamaican bail out, and finally it is under the table Guyanese Smelter Plant give away, between Jag and Madam kamla. Lord ,when will our people get a fair share? Sing Kiche! The relationship with the other Caribbean States when it comes to Guyana and T&T always boils down into who heads the Government. Cheddie Jagan was against Caribbean Federation because he was not too favourable of mixing with all of them black people, and I suspect that Kamla has the same sentiments. Remember that Dookeran assured India that if they took power they would structure the Caribbean in their own Image. Guyana is already stratified along the lines of 16th century India, with Africans marginalized into the roles of Dalits, and Indians, regardless of their pigment. climbing into Brahminian status. I suspect that it is just a matter of time before T&T joins Guyana. Man I love this. I love it because after this last election, it won’t be possible to fool black people any longer. Some times we need to experience ordeals and privations in order to open our eyes to the truth about some of the people who lurk in our midst. I know that before the tenure of this regime is over, eyes will be open, and it won’t be possible to put the genie of self awareness back into the bottle. How about this? Let’s have a level playing field. Let’s either play fair in Caricom, with each country carrying its proportionate share of the burden, and of course competing equally (i.e no protectionism) – or – let’s get rid of this Caricom entity that has been a failure so far because those that flout the spirit (read Barbados, T&T) don’t face any consequences. Countries like Bim and T&T use protectionist measures to achieve advantage, which therefore implies that they out to foot a disproprionate share of the bill, given that they have benefitted disproporionately. It’s almost impossible to export to these countries from elsewhere in the Caribbean, whereas goods from these countries flow freely elsewhere. The same is true for human resources. This cynical approach has rewarded the wrondoers for too long, enabling them to feel a sense of superiority which is truly unjustified. No one should be surprised at Kamla’s attitude because she’s not alone. I used to be a supporter or Caricom, but given that this has gone unchecked for so long I am now fed up and disgusted. Either fix this farce of Caricom or let’s all compete with each other treating our trading partners as they treat us. Let’s see how long that smirk will remain on the face of people like Kamla and too many like her in T&T and elsewhere.